UPDATE, 11/23/18. This show has been cancelled. The next GuitarTownCT show at Best Video Performance Space will be the Honey Dewdrops on Friday, Dec. 7. Nashville country singer David Peterson performs at Best Video Performance Space on Friday, Nov. 23, at 7:30 PM. Advance tickets $20 at www.guitartownct.com. Door tickets $25. A GuitartownCT Production. David Peterson sings traditional country, bluegrass and gospel music with a clarity and passion that is unique in today’s music world. “His voice has a lofty quality that carries from mountain-top to mountain-top. It’s powerful, complete and saturated with Bill Monroe, Hank Williams, and Jimmy Martin’s blues,” says Bluegrass Unlimited Magazine. 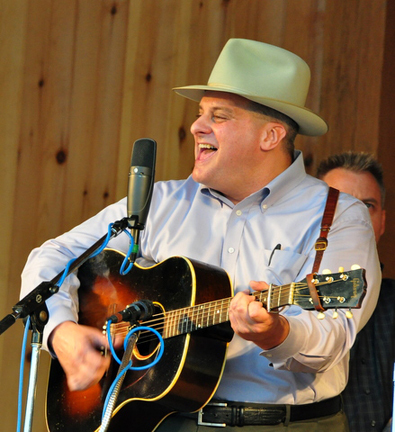 Peterson grew up near Boston, and moved to Nashville in 1995, where he formed “David Peterson and1946”, named after the year that Bill Monroe, backed by Lester Flatt and Earl Scruggs, first recorded bluegrass. When his band performs at Nashville’s iconic Station Inn, big bluegrass stars like Sam Bush, Charlie Cushman, Dennis Crouch and Michael Cleveland are often on stage with him. They enjoy the opportunity to play this classic music with Peterson. He has been playing mostly solo gigs for the last five years, and hasn’t performed in the Northeast since his last GuitartownCT appearance in 2012.